1971 DODGE CHALLENGER R/T - SIDE STRIPE KIT with R/T HOOD DECAL and QUARTER VENT DECAL - COMBO This Kit Includes: R/T Side stripe with R/T designation, Hood blackout decal with R/T logo, & Quarter panel side scoop blackout decal. CHOOSE A FACTORY COLOR: Part # QG-CDCL-71-511- (R/T side stripes) Matt Black (Flat), Black Gloss or White. & Part # QG-CDCL-7071-521- (R/T hood) Matt Black (Flat) or White. & Part # QG-CDCL-71-510- (Side scoop) Matt Black (Flat) only. Thank you for considering Graphic Express Stripes and Decals. Graphic Express manufactures automotive stripes and decals for Ford Motor Company. And Mopar, Dodge, Plymouth vehicles. 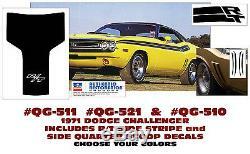 The item "QG-511 QG-521 QG-510 1971 DODGE CHALLENGER R/T SIDE & VENT STRIPE HOOD DECAL" is in sale since Wednesday, March 25, 2015.